The Political Insider - Intermarkets Inc. 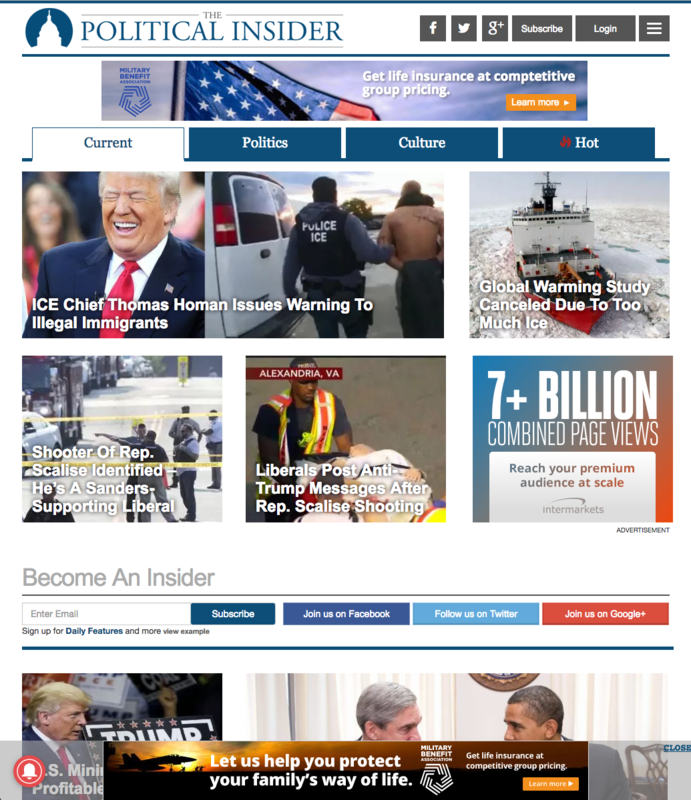 The Political Insider's commentary connects readers to the pulse of all things newsy and noteworthy. From what bills are discussed on the Hill to dishing in front of food trucks on Cap South, The Political Insider is the inside connection to influencers and politicos around DC, in the media, and beyond. This dynamic and growing audience provides an opportunity for advertisers to catch the eye of a highly social and engaged audience – consuming content across platforms and devices – and ultimately spending 6 minutes a day on the site. In addition to their voracity for all things political, Quantcast shows an affinity for sports, entertainment, and automobiles – including activity with retail giants like Cabella’s, Footlocker, and Eastbay. Advertisers can stand out by showcasing your brand experience in a premium canvas with our Rising Star units known for their prime in-view and hover rates. Messages can expect an added boost from the large Facebook fan base of active consumers, commenters, and sharers amplifying total Facebook reach to 14 million and beyond.